Refurbishing and caring for your deep-cycle battery (the type used in marine vehicles and RVs) keeps it working longer. The most important things are keeping the battery charged and its electrolytes at their highest recommended level. There are minimum and maximum levels to the battery's electrolytes and state of charge, mainly depending on whether it's a 12- or 6-volt battery. Make sure the battery isn't under- or overcharged; an undercharged battery can become crystallized, and an overcharged one can corrode. 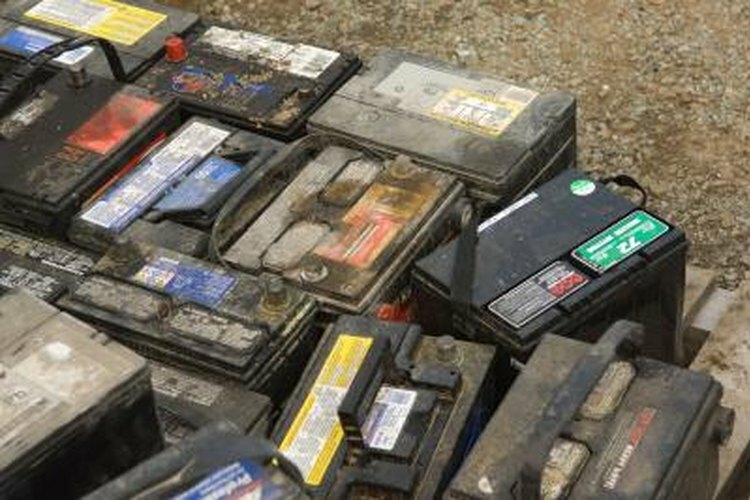 Clean any corrosion off of the battery using a mix of warm water and baking soda. Mix 1 lb. of soda with each gallon of water you use. Clean the battery terminals and the inside of the clamps with a post and clamp cleaner. Recharge the battery immediately after using it, charging it someplace well-ventilated with no flames or sparks present. Use a charger with a charge rate that's within 10 to 13 percent of the battery's 20-hour AH capacity. A three-stage charger that performs a bulk charge, absorption charge and float charge works best. Test the battery's voltage with a digital DC voltmeter to check its state of charge. Recharge the battery if the voltage is below 70 percent, which is 12.37 on a 12-volt battery and 6.19 on a 6-volt. The battery is fully charged at 12.73 (12-volt) or 6.37 (6-volt). Refill the electrolyte level by removing the vent caps and using mineral-free water (distilled works best). Fill it to just above the plates if the level is below that. Then don't add any more water until the battery is charged. Fill a charged battery up to 1/8 inch below the fill well. Disconnect the battery and store it any time you store the vehicle it's for. Remove the cable from the negative terminal first, and connect the positive battery cable when reconnecting it. Check the electrolyte level every month or every two months if you leave the battery in a plugged-in RV with a converter battery charger charging it. Replace any battery that leaks. Wear protective gloves and goggles and avoid smoking, jewelry and open flames when working on batteries. Flush any body part that comes in contact with battery acid, using plenty of water.